Senator Will Kraus was appointed as a member of the State Tax Commission. Kraus will be the successor of Ryan McKenna. Senator Kraus represents the Eighth District of Missouri and has been a leader in tax policy during his time in the Missouri State Senate. He served in the United States Army for 25 years. Kraus also previously served as a State Representative. He holds a bachelor’s degree in business administration from Central Missouri State University. There’ll be a special election in the 8th Senate District. We all know that newbie Governor Greitens has been trying to deal with a dire budget situation occaisoned by a corporate tax cut enacted in 2015 that ended up slashing incoming revenue by $155 million. Chickens are coming home to roost, you reap what you sow & etc., etc. Democratic senators who spoke against the bill said they worried it would threaten Missouri’s excellent credit rating and reduce state funds for education. Democratic Governor Nixon also knew. He called the bill “ill-conceived,” and correctly vetoed it. But nobody on the Republican side was listening. The determined Republican legislative majority covered their ears and passed the tax-cut over Nixon’s veto. It’s just one more case of willful ideologuing on the part of Republican politicians who ought to have been governing. It’s not like there hasn’t been lots of examples proving that radical tax cuts don’t really summon the elusive business fairy – Brownback’s failed Kansas economic experiment is a potent example right next door. And there’s lots more out there – Louisiana, Wisconsin, etc. are finding out that the GOP tax-cutting mantra doesn’t readily translate into workable policy. Less flashy but more important, a February report from the Upjohn Institute for Employment Research suggests, are the run-of-the-mill economic development incentives built into state law across the country and designed either to attract companies, to keep them in place, or to get them to add positions. In 2015, incentives for new or expanding export-based industries (i.e., manufacturing, tech, media, any company that sells its goods or services beyond the local economy) offset average state and local business taxes by 30 percent, costing the U.S. $45 billion. Republican state Sen. Will Kraus told The Associated Press that Trump’s support for reducing such taxes could open the door to axing corporate income taxes on the state level. Kraus will introduce a bill during the next legislative session beginning in January that would phase out the state’s current 6.25 percent corporate income tax. “I see an opportunity for us to be able to market Missouri as a corporate tax-free state,” Kraus said. He called the measure a “job-creation” bill. Under Kraus’ bill, the tax would drop to 4 percent in 2017 and 2 percent in 2018. It would be eliminated in 2019. So … is there any hope? Maybe. State Auditor Michelle Galloway is going to begin “what she calls a ‘budget integrity series,’ a slew of audits and financial reviews to better understand how the budget shortfall occurred … she hopes to better understand the difference between expected fiscal effects when tax breaks are offered and their actual ramifications on the state budget.” Just what the doctor ordered. But unless Galloway’s findings confirm the prior beliefs of our GOP pols, it may be too much to expect them to pay attention. Campaign Finance: Well, isn’t that special? Announcer: Jay Ashcroft uses his last name as a political tool, but he’s fallen far from the family tree. Jay attended the U.S. Merchant Marine Academy for three years, which by law means he must serve in the military, repay taxes for his tuition, or get special permission not to. But Jay never finished at the Academy. He didn’t serve. He hasn’t said he repaid taxpayers and he won’t tell us why. Did he get special treatment because his father was governor? Was he dismissed for bad behavior? Missourians don’t know because Jay won’t answer basic questions about a serious issue. Jay has since tried his hand as a professor, as a lawyer, as an engineer, and now he works for his dad’s law firm. In two thousand fourteen Jay refused to oppose a core component of Obamacare and lost his race for state senate. He told Missourians he was for voter ID law, started a signature campaign to get it on our ballot, but failed to submit even a single signature. We simply can’t count on Jay to finish anything he starts. We can’t even count on him to vote. 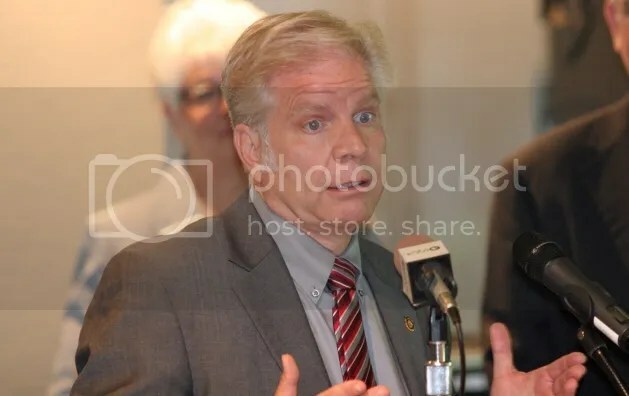 Jay Ashcroft, who wants to be the top elections official in the state did not vote in six major elections just between two thousand to two thousand twelve, including a two thousand four constitutional amendment vote to define marriage as between one man and one woman. Jay asks for your vote, but he doesn’t show up himself. He doesn’t answer your questions. He doesn’t finish the job. Jay Ashcroft has fallen a long way from his family tree and he is far from who he says he is. There’s so much right wingnut win in this it’s really difficult to figure out where to start. Sen. Kraus actually sponsored the 2014 legislation that changed the date of the Presidential Primary from February to March, in spite of warnings the new date was too close to April municipal elections and could cost millions, $37.5 million to be exact. His bill gave local election authorities just 3 weeks to prepare for another election. Yes, those in charge of running elections in St. Louis County should be held accountable for much of what went wrong on Tuesday. But so should lawmakers like Sen. Kraus, for sponsoring legislation that got us into this mess in the first place. Elections—and bad bills—have consequences. Sen. Kraus is currently sponsoring extreme Photo ID legislation that could make it harder for around 220,000 registered Missouri voters to cast a ballot—namely women, seniors, students, and minorities. So while we appreciate Sen. Kraus sharing his concerns for voters who may have been disenfranchised on Tuesday, we’d feel a lot better if he also cared about the 220,000(!) registered voters that could be be prevented from voting under his extreme proposal. State Senator Will Kraus (R-8) is seriously worried that there’s going to be a massive outbreak of voter impersonation sometime in the future, declaring that, “in the state of Missouri, without an ID, it’s pretty easy to get somebody else’s utility bill and say, ‘Hi I’m Bob Jones, I’m here to vote.’” Of course no one votes in Missouri without identification – which might be why there are almost no cases of the type of voter impersonation that’s got Kraus all excited. The point seems to be that Kraus and his GOP pals in Jefferson City want to change the Missouri Constitution to mandate the use of very specific types of state, military or federal photo ID. Not everyone has these IDs and they can be difficult to obtain. Other types of photo ID, such as student IDs, are not acceptable to our persnickety GOPers. The fact that this constitutional amendment would almost immediately disenfranchise about 220,000 registered voters in Missouri – just in time for a big presidential election – does not seem as important to these representatives of the people as stopping a type of voter fraud that essentially doesn’t exist. A study in 2012 showed that there were only 10 provable cases of voter impersonation in the U.S. over a 12 year period. But Missouri lawmakers like Kraus are obsessed. They’re willing to obligate the state to pay the $16 million dollars over a three year period that would be necessary to implement the requirement in a fair way, which means paying for the IDs, for obtaining supporting documents necessary to obtain the IDs, and advertising the requirement so that all eligible voters know what it takes to vote. Bear in mind that Missouri is a state that can’t even afford to repair its crumbling highways and bridges. If you have to resort to voter suppression to beat Hillary Clinton, maybe she isn’t as weak as you think. Of course, giddiness about the prospect of beating back the hordes of brown American voters and college-age hippies might be what’s making our own Missouri GOPers too “giddy” to exercise their best judgment, not to mention their higher moral faculties. Why is it that Republicans fear that they will loose in a fair contest? Shouldn’t free market advocates endorse the free marketplace of ideas? Do you think GOP disinclination to stay on the up and up might have something to do with the string of disasters that have resulted when conservative ideologues got their way in government? After all, unregulated financial (i.e., free) markets gave us the crash of 2008; tax cuts in Kansas, Louisiana, Wisconsin, Oklahoma, and elsewhere have been economic disasters. Hare-brained GOP efforts to run government like a business led to poisoning the children of Flint. Obstructionist GOPers in the Federal legislature have shown themselves incapable of the flexibility necessary to govern fairly – or to govern at all. Republican ideology just doesn’t have much of a track record, although the facts are often obscured or denied. Religious and racial bigotry may be all that has kept the party going. Voter suppression provides one more tool. If GOP ideology is demonstrably bankrupt, what is it that fuels the Republican drive to power at any cost? We know, of course, that many of our lawmakers are true believers and live in a perpetual state of misinformed denial. We also know that many are simply dumber than the proverbial post. But don’t you think it might also have something to do with people like the Koch brothers, the Humphries of Joplin, and St. Louis’ Rex Sinquefield? The so-called 1%, the folks who gain when the rest of us lose? And, incidentally, the same folks who rain dollars on our rambunctious GOP ideologues. Whether you’re right or wrong, nobody wants to disappoint the folks who pay the bills and open the doors to affluence. And once the goal is clear, who wouldn’t use any tool that presents itself? Uh, that was before the really, really, really big contribution from the really, really, really wealthy individual. Because we all know, one can never take an election result for granted. There is one exception. That’s it. No one else. That’s the one exception. So, what’s the $100,000.00 for and what does it really buy? Just asking. 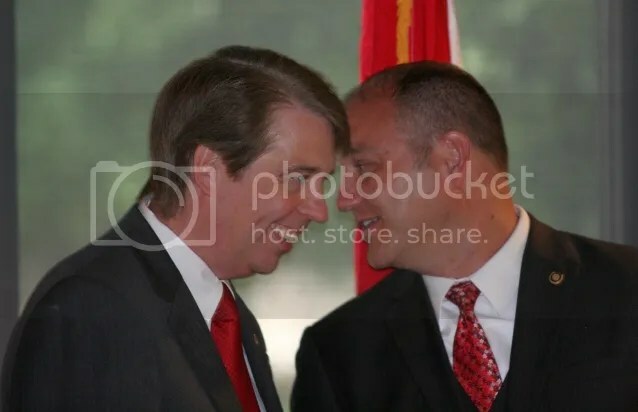 Well, well, somebody’s an early friend of Catherine Hanaway’s (r) 2016 campaign for Governor. We’ll definitely keep an eye on that $100,000.00. Campaign Finance: For what purpose? It’s not like his campaign desperately needs the money. For what purpose all that money? ….Missouri’s astroturf supported plutocratic future will be stunning in its magnificence…. Ah, now we understand. Chess, anyone? Missouri politics, where everyone is your friend and everything is all sweetness and light. Governor Jay Nixon (D), in Warrensburg on the campus of the University of Central Missouri – July 11, 2013. 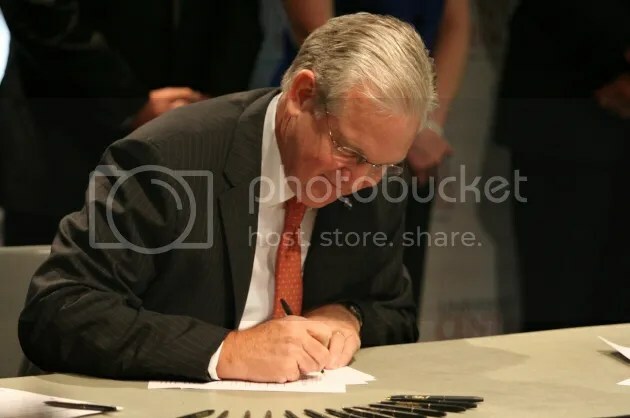 Yesterday morning in Warrensburg, on the campus of the University of Central Missouri, Governor Jay Nixon (D) signed SB 381 into law. The bill “officially defines in state statute an Innovation Campus as an educational partnership comprised of one or more Missouri public community colleges…one or more Missouri public or private four-year institution of higher education, one or more Missouri high schools or K-12 school districts, and at least one Missouri-based business.” In the scheme of things everyone involved in supporting the bill is patting themselves on the back that this is a good thing for education in the state. The amount of good varies with who you ask. Governor Nixon (D) signing SB 381 into law – July 11, 2013. These kinds of public self-congratulatory exercises are a magnet for state legislators in or near the districts where the bill signing takes place. The bill handlers from the Senate and the House tend to show up, too. Senator Will Kraus (r) and Representative Gary Cross (r) were in attendance and took the opportunity to heap praise. Senator David Pearce (r) and Representatives Denny Hoskins (r) and Dean Dohrman (r), who represent the districts most closely connected to the University of Central Missouri, were also in attendance. They, too, praised the bill and the institution. Ah, political science. That’s really interesting, considering that whole nullification thing was settled one hundred fifty years ago. Representative Gary Cross (r) – July 11, 2013. Representatives Dean Dohrman (r) (left) and Denny Hoskins (r) (right) – July 11, 2013. Here’s the all too familiar Kabuki element in Missouri politics: on one hand they’ll show up for the photo op and glory in the credit for one bill which supports an institution in their district, all the while, voting for a more far reaching bill which seriously screws that same institution. They can get away with it because most of their constituents usually aren’t paying attention when the screwing actually happens. And that occurred with HB 253. 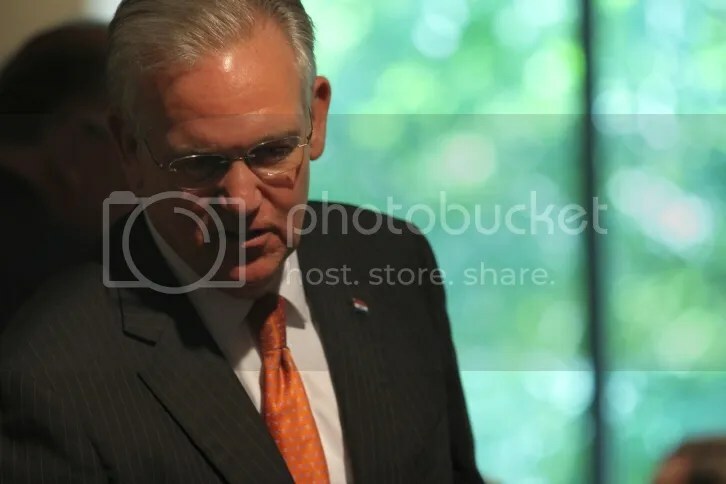 Governor Jay Nixon (D): With a price tag of at least eight hundred million dollars annually House Bill 253 would undermine our fiscal foundation now and for years to come. It’s the equivalent of cutting all support for higher education, all of it, closing all of our prisons, or shutting down the entire Department of mental Health. House Bill 253 is a dangerous experiment we simply cannot afford. These costs are real and immediate if my veto is not sustained. 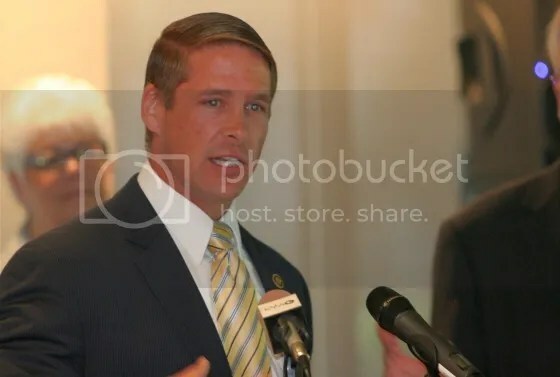 Senator Will Kraus (r) – July 11, 2013. Senator Schmitt moved that SS for HB 253, as amended, be called from the Informal Calendar and taken up for 3rd reading and final passage, which motion prevailed. The President declared the bill passed. Do you think they won’t vote to overturn the governor’s veto? Somebody’s spending big bucks to make sure they do overturn it. They’re republicans, the outlook isn’t good for the rest of us.